"It is not a good day because I’ve lost 25 seconds to Purito who was outstanding today. But I gained time over Dumoulin but this doesn’t make it a good day." "The more important time is the seconds we gained on Dumoulin today, and that's maybe the more dangerous number to watch." 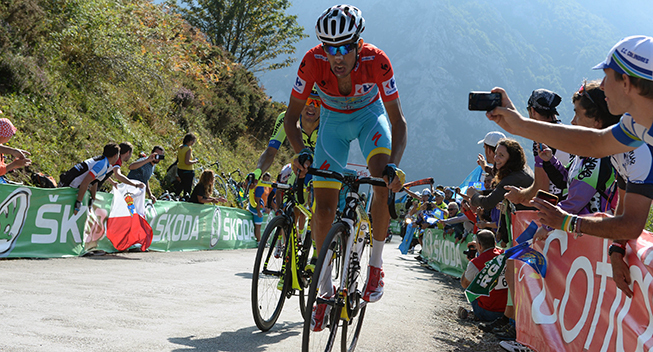 Those were the words of Astana's Mikel Landa after stage fifteen at the Vuelta a España. Landa worked at the head of the peloton with teammates in the final hour of racing, taking over two climbs and catching all breakaways for a very steep and very difficult final 3600m of racing. Luis Leon Sanchez, Dario Cataldo and Diego Rosa all took final explosive turns at the front of the diminishing peloton in the final 12km climb to Cabrales, with strong attacks by key rival Nairo Quintana caught and neutralized on the ascent. Landa finished just behind Aru on Sunday and 18 seconds back from stage winner Joaquim Rodriguez of Spain. Dutch rider Tom Dumoulin arrived further back and is now 1:25 behind Aru in General classification. Aru holds on to the race leader's Red Jersey with one more day of mountain racing on Monday before the rest day and the 38km individual time trial on Wednesday. "It is not a good day because I’ve lost 25 seconds to Purito who was outstanding today. But I gained time over Dumoulin but this doesn’t make it a good day," Aru said. "The difference is that Purito is more explosive than I am, that’s all. I gave everything but I could not avoid losing time. "I am worried by all the riders, Rodriguez, Majka and Dumoulin are very strong. After what he has already shown in time trials, Dumoulin is a real contender for the overall victory but I don’t know how much time he can gain in the Burgos TT. I also know that tomorrow’s mountain stage before the rest day will be very tough."